Its beautiful appearance explains its success with many aquarists. However, this species is not suitable for all aquariums: the fish are very temperamental and they let it know! If you want to keep them in a community aquarium, you have to be careful. This sheet explains how to find good roommates for your fish, and how to guarantee their happiness! How to feed the Green Tiger Barb? The Green Tiger Barb is omnivorous and accepts all forms of food. It will however have a preference for live and frozen prey. It is a big eater with an insatiable appetite, so you have to pay attention to the quantities distributed. It is useful to vary its food by plants even if the basis of its diet is carnivorous. What kind of behavior does the Green Tiger Barb have? It has a lot of personality and some will even say it has bad temper! And it’s true that it can be quite aggressive. However, it is especially the maintenance in too small numbers that triggers this behavior. Like all Barbus, it has a strong gregarious instinct and must be associated with several of its congeners to feel good (ideally, the group will have a proportion of 1 male to 2 females). The more important the shoal, the more wise it will be with other species. Indeed, the males will be busy quarreling and chasing each other for the attention of the females. As a result, aggression will remain intraspecific. You will also observe more beautiful colors by keeping the Green Tiger Barb in large numbers: the rival males parade their most beautiful colorations in front of the females. Finally, in general, it is very active and dynamic. Who can live with the Green Tiger Barb? The Green Tiger Barb can live in an aquarium, but given its temper, caution is required in the choice of its roommates. A thorough reflection on this before any purchase will avoid you a lot of compatibility problem. For example, its lively and very active temperament will scare slow, calm fish like Discus. Fish too small will serve them as meals. 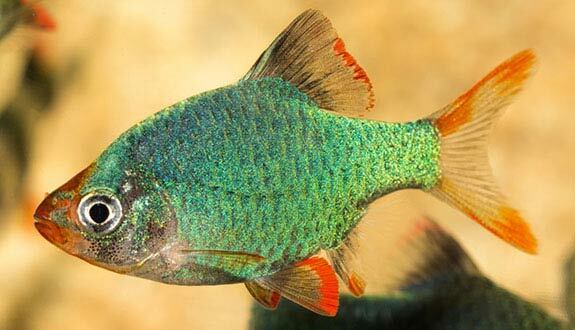 Attention also to cohabitation with species with large fins, such as Guppy, Gouramis or Fighters (the Barbus will certainly spoil the fins). The ideal companions will be other Cyprinids of identical size or Crossocheilus and Garras. You can also associate with Botias, Rainbow fish, Grouse or even nGastromyzons for example. How to breed the Green Tiger Barb? As for most Barbus, its breeding in aquarium is quite possible. Dedicate a special aquarium to guarantee a high rate of fry. Place in this aquarium (15 L or 3 Imp Gal or 4 US Gal) a protective grid at the bottom and garnish with fine-leafed plants such as Java moss for example. Fill it with mature water and aim for a temperature of 26°C or 79°F and a pH of 6.5/7. Eventually add peat extract. Condition the parents by offering them an abundance of live prey. When the females appear gravid, choose a couple and introduce it into the spawning tank. Males are very aggressive and can even kill non-pregnant females. If spawning does not occur within 24 hours, it is better to separate the pair and try again later. Spawning can include up to 500 eggs per female and incubation lasts 36 hours. Fry growth is fast. Fry food: nauplies of artemia and cyclops. Which aquarium for the Green Tiger Barb? Its environment does not matter much to him. 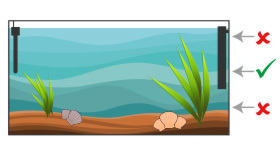 However, it should be noted that it feels better in aquariums with a dark substrate and a lush vegetation (composed of rather robust and strong plants). The combination of this few elements will improve its brawling character. It does not like dirty water, so opt for good filtration and make water changes regularly. Beginner aquarists can choose this species which is quite flexible with its water parameters. The only condition is to keep its water always very clean. Victims of its success, the individuals sold today are unfortunately quite weak genetically (inbreeding). It is therefore a species that will often be prone to malformations and diseases. The Green Tiger Barb sometimes searches the ground, so it must be non-cutting. The selection of this species has given albino, golden, and steel blue variants. Note that there are also colorful varieties almost fluoerscent (GloFish) to avoid absolutely because it is a torture for the fish. In addition, the European Union has banned this practice as well as the importation of this unfortunate fish.